That, to my eyes/ears, is what the sound of a great guitar looks like. 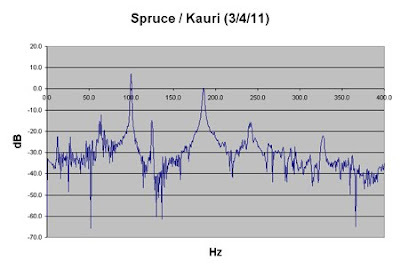 Each part of the guitar tends to naturally vibrate at a certain frequency and the peaks in the chart above show those points. Three of the key points are the frequencies for the top, back, and air chamber. In theory I could build another guitar that had those same points and it would sound just like this one. In reality? Ask me again in 30 years.